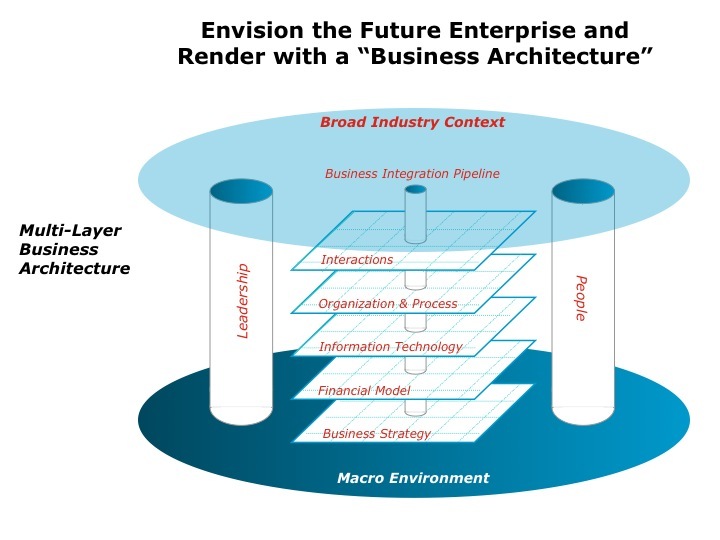 I often take on the role of Business Architect for my clients to design for them front-to-back enterprises that embody future state visions, innovation, and sustainable competitive advantage. Business architecting is a blend of science and art with the role of the Business Architect requiring the integration of multiple perspectives and multiple disciplines to create a tight package for the client. Some call this “Design Thinking”. Tim Brown, CEO of IDEO, and Roger Martin, Dean at the Rotman School of Management, currently evangelize the application of Design Thinking in the context of entire businesses, going well beyond traditional product development role of designers. Brown and Martin have both developed powerful frameworks that drive mindset change for interdisciplinary teams as those teams develop creative solutions to business and social problems. Brown and Martin have authored books on Design Thinking (among them, “Change By Design” by Brown and “The Design of Business” by Martin) which I highly recommend. Here is a Multi-layer Business Architecture framework that I have used successfully on consulting engagements with numerous senior executives over the years. Layers and “plumbing” comprise the architecture model, which provides an executive a means to envision the transformed business. The framework also gives interdisciplinary, cross-functional teams a hard deliverable to create as they formulate the right, insightful problem statement and develop innovative solutions to tackle the complexities of transformation. By design, the framework sets up detailed planning, management of business impact, mitigation of risks, establishment of implementation teams, integrated execution, and comprehensive transformation management. Business architecting applies Design Thinking to an entire enterprise. The Multi-layer Business Architecture helps business design teams organize work, provides structured play areas for creativity, and serves as an integrated rendering of a senior executive team’s vision. Change is not an absolute. 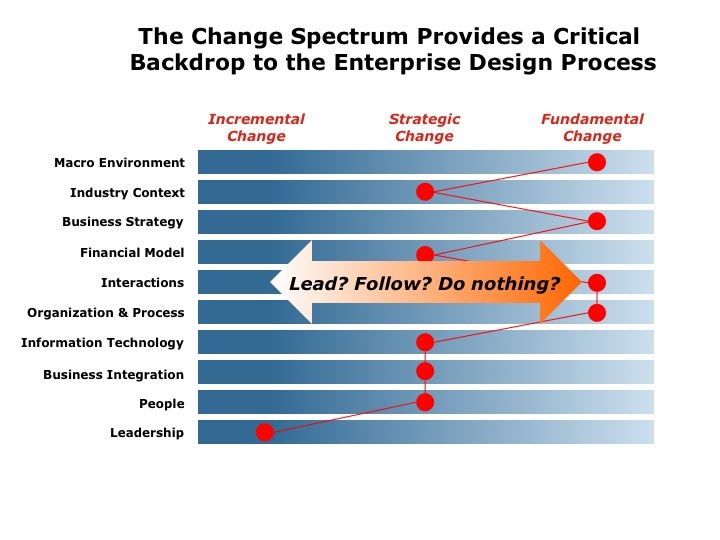 Degrees of change reside along a spectrum ranging from incremental change to larger scale, strategic change to up-heaving, fundamental change. As a Business Architect, I map the change occurring or required along each layer of the Multi-layer Business Architecture. The end goal is to aid an executive to achieve or sustain competitive advantage and other measures of business improvement for the executive’s firm. The leadership of a firm might choose to lead change in certain layers, follow a leader in others, and do nothing for the rest. Senior executives pick their spots. Map it out. Select a change strategy. Manage it. Beat the competition. For implementation, an executive team cannot simply jump in and start transforming an enterprise into the vision captured by a Business Architecture. The team must know enough about the current state to know where to begin the transformation. 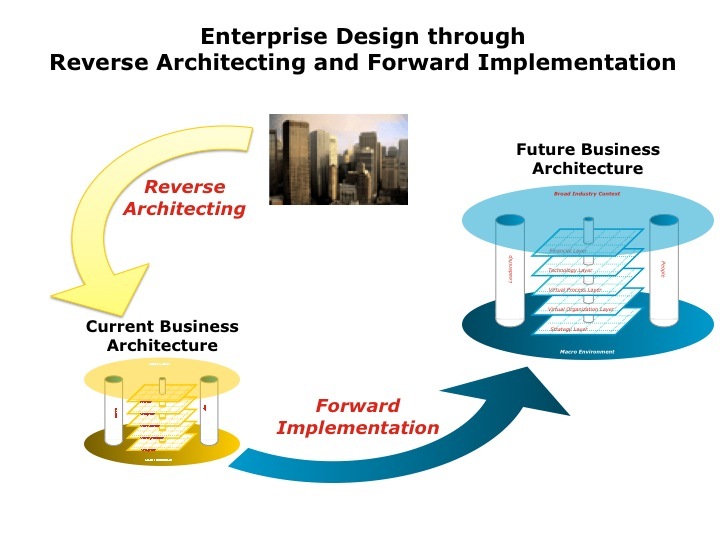 Here, a process of Reverse Architecting lays out the current state of an enterprise in the same framework as the future-state vision. With this construct, leadership and implementation teams have detailed blueprints and plans for transformation. Consider the remodeling of a kitchen. It is best to know where the plumbing and wiring are behind the walls before beginning to tear down, re-plumb, re-wire, and re-build. Consider adopting the role of Business Architect when your enterprise is challenged with the need to transform. Use the mindset, techniques, and tools of design thinking to create a vision for the transformed business. Develop a Multi-layer Business Architecture to provide detailed blueprints and plans to implement the vision. Do not neglect the Reverse Architecture to know what you are changing, where to start, and how to direct implementation teams.